Geothermal Energy Options, LLC engineers and installs all systems from the ground loops to the heating and cooling equipment. Geothermal systems absorb and disperse heat energy to and from the ground through a geothermal system. Some of the advantages of using geothermal energy include the facts that they are eco friendly, comfortable, versatile, and long-lived. But there is one advantage that stands above them all and that is how geothermal cost savings. Heat pumps are the most cost effective source of heating and cooling on the planet, which means you’ll have incredibly low monthly utility bills. You may wonder how they accomplish this so let’s walk through the process of how heat pumps will save you money, starting with a lesson on efficiency. Geothermal heat pumps are able to deliver low-cost heating and cooling because they tap into a free, renewable energy source: the heat beneath your feet. 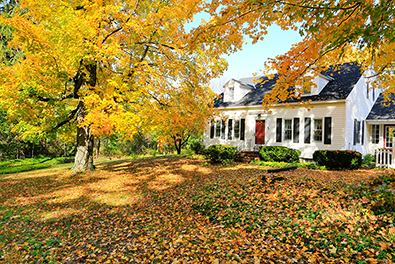 A geothermal heat pump absorbs free heat from the warm earth and transfers it into your home. Unlike conventional heating systems like oil, natural gas, coal or wood heat, there is no combustion or fuel source required. These conventional forms of home heating burn fuel to create heat. This is an inefficient process because some energy is lost up the flue, which means less energy is put into the home than what the actual fuel contains. Have you ever seen a furnace that advertises 97% efficiency? That means for every $1 you spend on heating, you’ll get $0.97 of heat energy. In contrast, heat pumps are just moving existing heat from one place to another. Since there is no cost for the heat itself, a heat pump can put out more heat energy than the power it consumes. For every $1 you spend on heating, you get $4 of heat energy. This process makes heat pumps far more efficient than conventional sources, and that’s why they’re known as the most efficient heating and cooling source available today. This increase in efficiency means you pay less to get the same amount of heat as shown in the following example. Considering installing a geothermal system, but afraid of getting swindled by shady dealers or bad installers? To ensure you choose a good dealer and installer, we've collected a list of the questions you should ask before hiring. 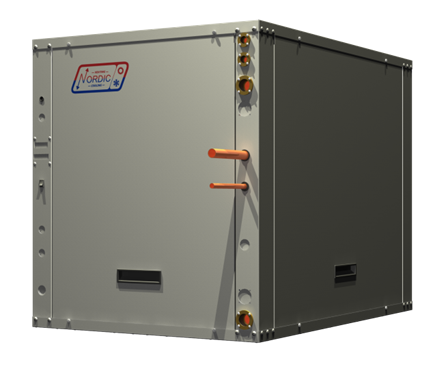 The Nordic® Liquid-to-air heat pumps is a water to air heat pump that harvests their heat from deep below the ground, and distributes it throughout the house in the form of hot air. In the summer, these heat pumps reverse the process and cool your home. 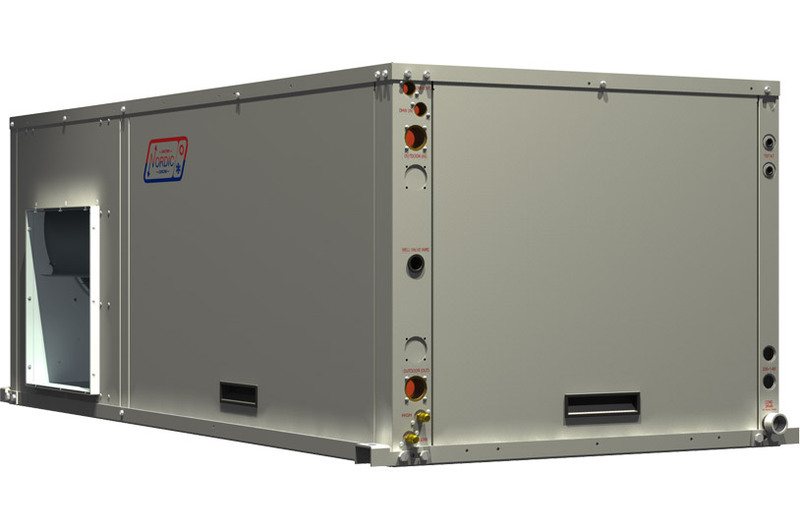 Nordic®’s liquid-to-air heat pump is called the R Series. The R Series is a full package active heating and cooling unit. The R Series works with either well water or geothermal ground loops. This water to air heat pump comes with optional domestic hot water and provides hot water in both the heating and cooling modes. The R Series is available in slim horizontal, vertical, and split configurations. 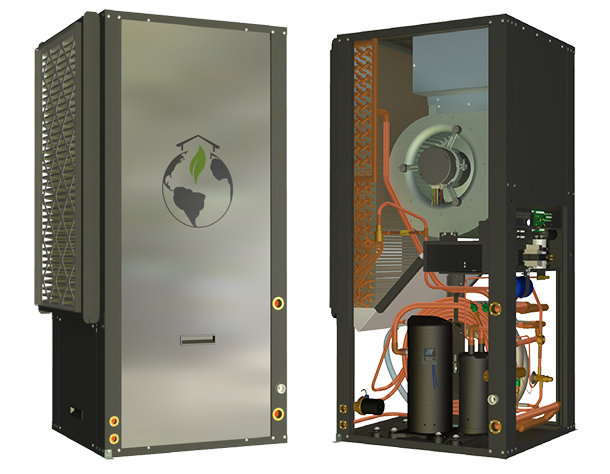 This type of heat pump is commonly used in residential renovation projects when retrofitting from other air duct systems. The R Series is available in all configurations in sizes from 0.75 to 6.5 nominal tons. Turbotec® coaxial heat exchangers, cupro nickel heat exchangers available. Taco® slow closing water valve kit are available for open loop installations. Smallest 5-6 ton footprint in the industry at 24” x 28”. Completely insulated water lines, accumulator and heat exchanger. Oversized evaporator (Ex. A three horsepower heat pump as a five horse power evaporator) so they can achieve very high COP’s even when operated on ground loops with EWT’s as low as 25°F. Known as the RH Series, this unit is the horizontal version of the classic vertical R Series. This heat pump has all of the same features as the vertical unit, but is configured horizontally, perfect for basement retrofits where there isn’t enough height to accommodate a regular sized unit. Geothermal Energy Options, LLC installs the Nordic® Heat Pumps – Liquid to Water geothermal heat pumps for use on open water wells and closed ground loops. The heat pumps are capable of a hot water output up to 120°F – for in-floor heating, pool heating or any other hot water requirement. Ready to learn more about our services? We have solutions to help you and ensure a more efficient heating and cooling system. Interested in geothermal, ductwork, Aeroseal, or spray foam insulation? Request a quote today.